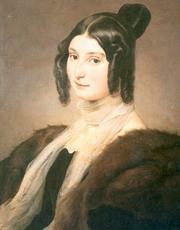 ... 1814, Elena Clara Antonia Carrara Spinelli was born in Bergamo, Italy. She married at 17 (separating amicably a decade and a half later), and Clara Maffei (right) soon became known as the host of a Milan salon known as the Salotto Maffei. There gathered literary lights like Balzac, artists, scholars, composers like Liszt and Verdi, and supporters of the Risorgimento, or "resurgence," a political and social movement that favored the unification of Italy. Maffei died from meningitis in 1886.